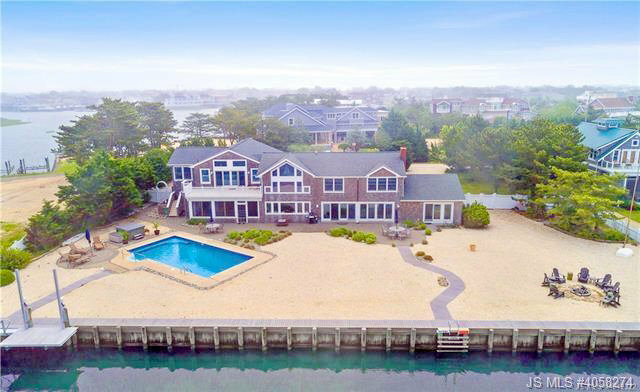 2 Story,See Remarks, Single Family - Beach Haven Borough, NJ Truly a Coastal Living property, fronting 186 on the bay-this 4500 sq ft, 6 Bedroom 4 Bath estate is secluded & serene off a private drive in Websters Lagoon. Mesmerizing water views are showcased stretching across the 30 ft. LR/DR,adorned with a fpl.The kitchen is outfitted with crisp white cabinetry & complementary quartz counters that house the high-end stainless appliances & beverage refrig. The adj fam rm leads to the screened DR. A 1st flr full bth services 2 bdrms, one with sliders.A level up, a stunning addition beckons with vaulted ceilings then leads to a deck with pool access.This area is perfect for extended family offering a separate LR with wet bar, 2 Bdrms,& a full bth.The 2nd fl S. wing, offers a vaulted Master suite w/a walk-in closet,travertine bath w/steam shower,6th bdrm, and sitting loft.The outdoor entertainment space is highlighted by a 36 x 18 saltwater heated pool, hot tub, fire pit, and automatic boat lift and jet ski dock, + a 50k sq ft riparian grant.